Historically, Bandridge hasn't really been a name to conjure with in audiophile circles, bringing with it connotations of ultra-cheap accessories. However, under its Profigold brand, the company has been making some interesting stuff of late, and this cable looks absolutely the part. A rather bulky bi-wire design, some 5x20mm in cross section, it consists of four conductors of silver-plated copper wire insulated in foamed polythene with an overall sheath of PVC. It's sold off the reel and is nice and easy to strip and connect up, and because it's possible to 'unzip' the individual conductors, cheapskates could easily use it in single-wire mode at an effective £9 per metre. We used it with some nice Profigold clamp-on banana plugs at £15 per set of four. 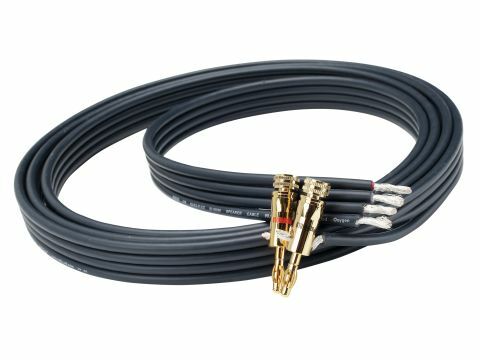 The one area where we have reservations about this cable is the bass, which seems dry and lacking the bloom that makes it obvious whether, for instance, one is listening to a quiet pitched note or a gentle tap on a bass drum. There's plenty of extension, but bass 'tunefulness' falls short. Apart from that gripe, though, there's much to enjoy in this cable's sound, including particularly clear treble with good extension but no hint of excessive brightness. Stereo imaging is very fine too, depth extending well behind the speakers with good definition. There are plenty of decent cables to choose from at this price, of course, but this one holds its head up among its peers.